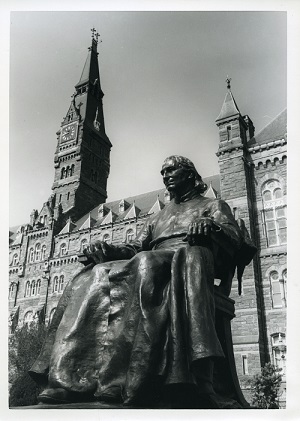 This site provides centralized access to written descriptions (known as finding aids) of hundreds of archival resources housed at Georgetown University: in the Manuscripts Unit, the Rare Books Unit and the University Archives in the Booth Family Center for Special Collections, Lauinger Library; in the Woodstock Theological Library, Lauinger Library; and in the Bioethics Research Library Archives, the Kennedy Institute of Ethics, Healy Hall. New content is added on a regular basis. You can use this site to locate resources relating to your area(s) of research. It will also link you to the curatorial staff who oversee the resources so that you can submit questions or arrange to work with the original materials. The Society of American Archivists' Glossary of Archival and Records Terminology by Richard Pearce-Moses published in 2005 defines "archives" as: Materials created or received by a person, family, or organization, public or private, in the conduct of their affairs and preserved because of the enduring value contained in the information they contain or as evidence of the functions and responsibilities of their creator. An archival resource can range in size from a single scrapbook to thousands of folders of institutional records and can include items such as letters, diaries, photographs, research papers, drafts of literary works, newspaper clippings, audio/visual material, financial records, meeting minutes, and reports. A finding aid is a research tool which describes an archival resource and facilitates discovery of information about specific subjects, people, places, or events within it. A finding aid can help you determine whether the resource it describes might be relevant to your information needs. The level of detail will vary between finding aids but they generally supply core information such as the size, date span, subject coverage, and arrangement of resources. Some will also include an administrative history or biographical note, scope and content note, and/or inventory of boxes, folders or items.